Hi this is a high quality rebuilt Ford Motorcraft distributor by Cardone for an early 352 360 390 427 428 or other FE engine. This can only be used in engines with points style ignition. This unit has the single vacuum diaphram advance and single points. All units are thoroughly disassembled, clean and inspected and rebuilt using new bushings, seals, points, condenser, fasteners and advance module. Please note: this unit will NOT fit a 289, 302 or 351 windsor or cleveland or 429-460 engine. Fits mustang cougar torino falcon galaxie fairlane 500 f100 custom ranger explorer bronco comet cyclone and others. Thanks and see my other auctions! 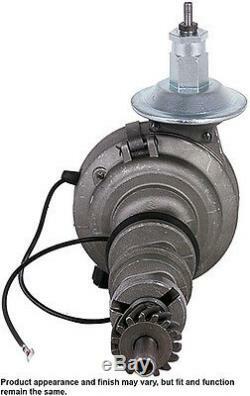 The item "360 390 428 REMAN DISTRIBUTOR mustang torino fairlane 30-2807 66 67 68 69 70 71" is in sale since Tuesday, June 11, 2013. This item is in the category "eBay Motors\Parts & Accessories\Car & Truck Parts\Ignition Systems\Distributors & Parts". The seller is "enjay14" and is located in Linden, Virginia. This item can be shipped worldwide.